Turn favourite photo into a precious keepsake. A perfect gift for Christenings, Baptisms and birthdays or a beautiful memorial gift in honour of a little angel gone too soon. Your porcelain photo plate is 22.5cm diameter and you are able to have a short message put on the back of the plate as an optional extra if you wish. Each image is made into a decal, securely adhered to the white plate and fired in a kiln three times. This procedure ensures every plate is food safe and dishwasher safe. The design will not fade or discolour like many other personalised plates on the market. These photo plates are also available in colour photo and sepia-tone photo. Please allow two weeks for delivery of your photo plate. 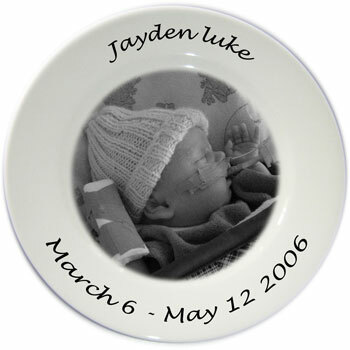 Please email images to meagan@keepituniquekeepsakes.com.au either before or after ordering.